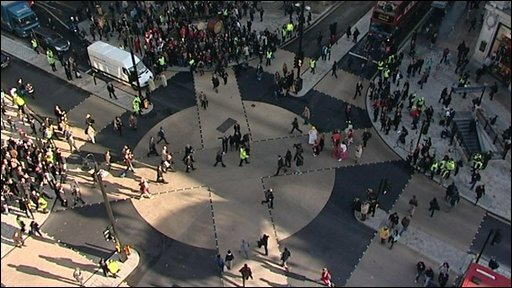 One of Europe's busiest diagonal crossings has opened in central London's Oxford Circus. Based on crossings in Tokyo, the new design stops traffic in all directions, allowing shoppers to cross diagonally in an "X" as well as straight ahead. The £5m junction is able to handle double the number of pedestrians and ease overcrowding at the busy intersection. London Mayor Boris Johnson unveiled the crossing by striking a gong. In homage to its Far Eastern inspiration, Mr Johnson struck a 2m high gong as Japanese musicians played taiko drums. A giant X, in the form of 60m (196ft) of red ribbon was also unfurled by devotees of cult Japanese Manga characters dressed in colourful costumes. Mr Johnson said the crossing, controlled by traffic lights, was "a triumph for British engineering, Japanese innovation and good old fashioned common sense". "The head scratching frustration caused by the previous design is over and we've brought one of the world's greatest crossroads into the twenty-first century," he added. Oxford Circus is one of the most popular destinations in the world, with more than 200 million visitors a year. Street clutter and barriers at the junction of Oxford Street and Regent Street have been removed, giving shoppers and workers that visit annually around 70% more freedom to move. As part of the works, more than 500m (1,640ft) of both Regent Street and Oxford Street are being redesigned with wider pavements and new lighting. The redesign doubles the amount of pavement and creates more space around the exits to Oxford Circus Tube station. "Easier access to Oxford Circus Tube station will benefit many thousands of passengers who use the station each day," said London's Transport Commissioner Peter Hendy. The revamped crossing reopens in time for the switching on of the Regent Street and Oxford Street Christmas lights on 3 November.